Here are some pictures of finished stocks sent in by some of my customers. Some are fit and finished by professionals, but more often they are first time efforts by folks that want to take a shot at it themselves. I always enjoy seeing these, and often wonder what becomes of the wood I send out. There are pictures of customer projects throughout this website. I will update this as suitable pictures come in, but I am the first to admit that keeping this website up to date is not my priority, sawdust comes first! .50/90 Rolling Block belonging to Mike Johnson. 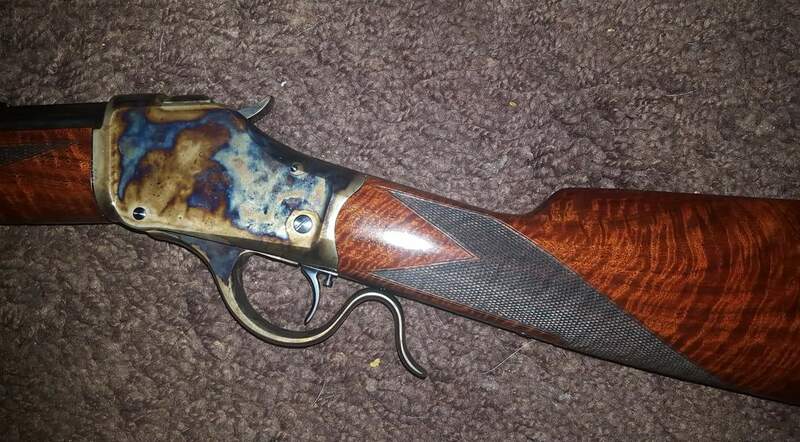 This pattern is the standard Rolling Block Shotgun with a Schnabble forearm, Select Fancy. Another view of Mike Johnson's Rolling Block. Western Maple on a Cadet, by Lou Wither. I don't usually make large forearms for the Cadet, I think Lou made this one himself. A #2 Rolling Block built by Curt Hardcastle. A 94 Marlin cowboy in knotty screwbean mesquite. Fitting and finish by Dan Edwards. A match set of F Class rifles in high grade Quilt Maple, by Jeremy Chan, while earning his gunsmithing degree at Trinidad JC. There is a link to Jeremy's gunsmithing blog on my links page. Well worth the time to visit. 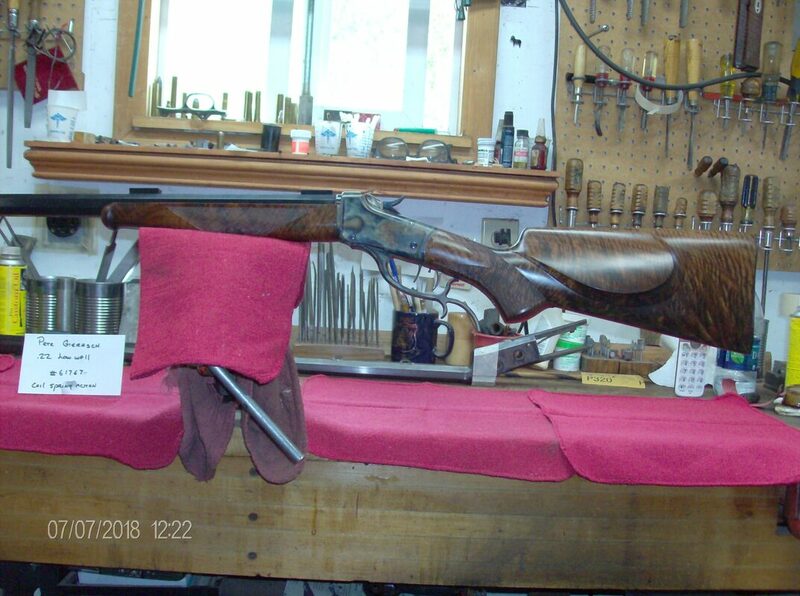 A nice Winchester Low Wall built by Rich Mckinney for Peter Gierasch. The stock style is the DeLuxe Sporting pistolgrip with shadowline cheekrest. The wood is Select Extra Fancy Claro Walnut, cut in the 1970's. A nice pair of Marlin model 39's from Rocky Tippy. Top pistolgrip rifle has the semi crescent style in a nice fancy black walnut. Below shows part of the buttstock, note that the grain flows perfectly in line with the wrist, continuing through the forearm. Textbook layout. This is whole package is a real prize in anybody's book.